We're excited to welcome Cleveland Indians utility player Ryan Flaherty to the podcast. A special thanks to this show's sponsor, Lumberlend. Head to www.Lumberlend.com and enter the coupon code CSP to get free shipping on your order of two or more bat mugs. How being a multi-sport athlete from Maine had a profound impact on Ryan’s early athletic development. How he transformed from a gangly, undrafted high school senior into a SEC standout as a freshman. Why third base was the most challenging position for Ryan to learn as a utility man. What Ryan’s routine is when he does not start, but needs to be ready to strategically enter in later innings. Why Ryan could be a managerial candidate after his playing days due to his appreciation for the behind the scenes influence of coaching in the game of baseball. You can follow Ryan on Twitter at @RFlaherty3, and on Instagram at @RFlaherty27. This episode is brought to you by Lumberlend Co. If you're looking for a unique gift for a baseball fan in your life, you'll definitely want to check this out: they've hollowed out the bat barrel and created a cool drinking mug. You can customize these with colors, names, logos, and photographs. They're also an officially licensed MLBPA product, so you can get your favorite teams and players incorporated into the designs. I've used these as gifts with great feedback, so I'm confident you'd experience the same. The crew at Lumberlend is offering free shipping on two or more bat mugs with the coupon code CSP at checkout. Just head to Lumberlend.com to design yours today. If you like what you hear, we'd be thrilled if you'd consider subscribing to the podcast and leaving us an iTunes review. You can do so HERE. And, we welcome your suggestions for future guests and questions. Just email elitebaseballpodcast@gmail.com. Sign-up Today for our FREE Baseball Newsletter and Receive Instant Access to a 47-minute Presentation from Eric Cressey on Individualizing the Management of Overhead Athletes! 1. On average, female athletes respond differently to eccentric stress than male athletes do. Last year, I wrote a blog (Making Movement Better: Duct Tape or WD40?) that touched on the fact that many pitchers lose range of motion at the shoulder and elbow as adaptations to the crazy high eccentric stress experienced during pitching. I also was careful to note that not everyone loses range of motion; in fact, some athletes gain motion (become more unstable). Perhaps unsurprisingly, research in the softball pitching world shows that females don't lose range-of-motion following softball pitching even though they're still encountering noteworthy eccentric stress. Females are more likely to be hypermobile, so it makes sense that they become more unstable than they do "tight." In short, you probably aren't going to have to work as hard to gain ROM in softball pitchers; your efforts are better directed at regaining neuromuscular control with low-level stabilization exercises. 2. Reaching exercises should drive thoracic flexion and scapular upward rotation, but not necessarily pec recruitment. 3. The best coaching cue for an exercise might just be to do a different exercise. Also on that Q&A, I got an inquiry about what to do with low back pain due to excessive arching at the bottom of an ab wheel rollout. The answer was pretty simple: regress the exercise; you aren’t ready for ab wheel rollouts. With anterior core exercises like this, it works a bit like a seesaw: the further the arms go away from the body, the harder the exercise feels (imagine moving a little kid to the end of a seesaw; his weight doesn't change, but the amount of force at the other end of the seesaw needed to offset him does simply because of his positioning). When an individual dumps into anterior pelvic tilt/lordosis (excessive arching) as the arms get further away from the body on a rollout, it's one means of shortening that distance. And, it allows the individual to hang out on the passive restraints on the posterior aspect of the spine instead of using active muscular control to create stability. A better option would be a stir the pot, stability ball rollout (if you don't go DOWN as far, you don't go OUT as far), or even just a regular prone bridge. These regressions are easy inclusions that are tremendously helpful when dealing with less trained individuals or athletes with long limbs (and spines). If you're looking to learn a bit more about this topic, I'd encourage you to check out my resource, Understanding and Coaching the Anterior Core. 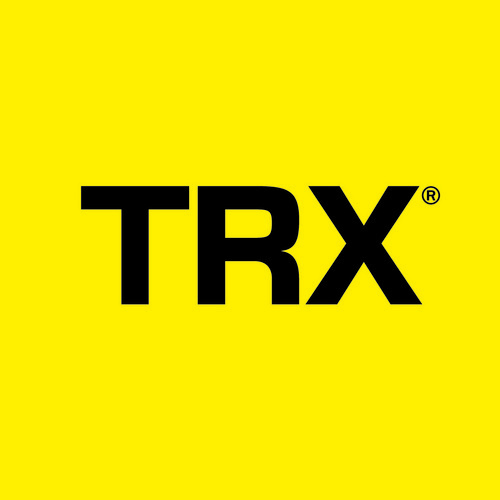 This seminar presentation is a thorough tutorial on how to best coach and program these invaluable exercises. We're excited to welcome Chicago Cubs relief pitcher Steve Cishek to the podcast. A special thanks to this show's sponsor, Lumberlend. Head to www.Lumberlend.com and enter the coupon code CSP to get free shipping on your order of two or more bat mugs. Steve explains ways young pitcher’s can build rapport with their catcher. You can follow Steve on Twitter at @srShrek31, and on Instagram at @srShrek31. We're excited to welcome San Francisco Giants infielder Joe Panik to this week's podcast. A special thanks to this show's sponsor, Athletic Greens. Head to http://www.athleticgreens.com/cressey and you'll receive a free 20-pack of Athletic Greens travel packets with your first order. Joe’s journey to MLB and the developmental years he spent in college and minor league baseball to grow into the player he is today. Joe discusses the challenges of being scouted as a hitter from the Northeast and how this impacted the direction of his early career. The reason he chose to attend St. John’s and honor that commitment despite enticing offers from bigger schools. How criticism and speculation in Joe’s early career propelled him to be meticulous in mastering his craft. The fundamental focused mindset that has led Joe to become the consistent Major League player he is today. How Joe has modeled his game to play to his strengths, allow him to be himself on the field, and find success at the highest level. The culture of the San Francisco Giants and how coaches and veteran players can make the transition to the next level easier for young players. Joe’s hitting approach and why he continues to have a low strikeout percentage when the game of baseball is trending in the opposite direction. The adjustments he has made to his swing and training in preparation for the 2019 season. You can follow Joe on Twitter at @JoePanik, and on Instagram at @JoePanik. This episode is brought to you by Athletic Greens. It’s an all-in-one superfood supplement with 75 whole-food sourced ingredients designed to support your body’s nutrition needs across 5 critical areas of health: 1) energy, 2) immunity, 3) gut health, 4) hormonal support, and 5) healthy aging. Head to www.AthleticGreens.com/cressey and claim my special offer today - 20 FREE travel packs (valued at $79) - with your first purchase. I use this product daily myself and highly recommend it to our athletes as well. I'd encourage you to give it a shot, too - especially with this great offer. We're excited to welcome two-time American League Cy Young winner Corey Kluber to this week's podcast. A special thanks to this show's sponsor, Athletic Greens. Head to http://www.athleticgreens.com/cressey and you'll receive a free 20-pack of Athletic Greens travel packets with your first order. Corey’s journey to MLB and the developmental years he spent in college and minor league baseball to grow into the player he is today. The establishment and refinement of Corey’s process. Corey’s creation of routines to inspire comfort on game day. The pre-pitch routine and mental approach Corey implements when he toes the rubber. Having a feel for pitches, reading hitters, and building a relationship with the catcher to have the ability to make adjustments on the fly and compete at the highest level. The design of Corey’s pitching arsenal, including: developing his slider, learning to throw a 2-seam fastball, and having confidence in the changeup. A discussion of the throwing and training programs Corey relies on to remain durable. The entertaining story of CSP-MA pitching coordinator Christian Wonders' first day throwing with Corey. You can follow Corey on Instagram at @ckluber28, and on Twitter at @CKluber. To learn more about The Kluber Foundation's charitable initiatives, be sure to check out www.CoreyKluber.org. It's time for this month's installment of my random thoughts on sports performance training. In light of my ongoing 30% off sale (ending Sunday at midnight) on my Sturdy Shoulder Solutions resource (enter coupon code BASEBALL at checkout for the discount), I thought I'd focus this edition on the shoulder. 1. If you want a healthy shoulder, getting tobacco products out of your life is a good place to start. "Cigarette smoking adversely affects a variety of musculoskeletal conditions and procedures, including spinal fusion, fracture healing, surgical wound healing, tendon injury and knee ligament reconstruction. More recently, smoking has been suggested to negatively impact rotator cuff tear pathogenesis and healing. Tobacco smoke contains nicotine, a potent vasoconstrictor that can reduce the blood supply to the already relatively avascular rotator cuff insertion. Furthermore, carbon monoxide in smoke reduces the oxygen tension levels available for cellular metabolism. The combination of these toxins may lead to the development of attritional rotator cuff tears with a decreased capacity for healing." Many times, we're looking for the best exercise, rehabilitation protocol, soft tissue treatment, or volume amounts - but we really ought to be looking at lifestyle factors. With a large baseball readership on this site, the logical next question: are these harmful effects also noted with smokeless tobacco (i.e., dip/chew)? The research is somewhat sparse, as it's harder to study a younger, active population than a bunch of middle-aged post-operative rotator cuff patients. However, it's hard to believe that the aforementioned carbon monoxide implications would cause 100% of the issues and that the nicotine would serve as just an innocent bystander. So if you're looking to check every box in your quest to stay healthy, it's not a bad idea to lay off the dip. And, if healthy tendons aren't enough to convince you, do yourself a favor and read this article by Curt Schilling. 2. The 1-arm, 1-leg landmine press isn't a mainstay in your training programs, but can be a perfect fit in a few circumstances. This looks like kind of a wussy exercise, but I actually really like it in two circumstances. a. It's awesome in a post-surgery period when you can't load like crazy, but still want folks to be challenged in their upper extremity progressions. The single-leg support creates a more unstable environment, which means that antagonist activity is higher and there is more work going to joint stability than actual movement. In other words, it makes pressing safer. b. Once we get to the inseason period, it allows us to check two boxes with a single exercise: single-leg balance and upper body strength (plus serratus activation/scapular upward rotation). 3. Posterior pelvic tilt increases lower trap activation. I've written about it a lot in the past: core positioning has an incredibly important impact on shoulder function. Check out this study on how reducing anterior pelvic tilt increases lower trapezius activation during arm elevation and the return from the overhead position. In my experience working with extension-rotation athletes (particularly baseball players), one of the biggest risk factors for shoulder injury is when the lower trapezius can't keep up with the latissimus dorsi. Just consider the attachment points of the lat in the picture below; as you can imagine, if you posteriorly tilt the pelvis, the lat is inhibited, making it easier for lower trap to get to work. The lower trapezius is very important for providing posterior tilt (slight tipping back) of the scapula and assisting in upward rotation. These two functions are key for a pitcher to get the scapula in the correct position during the lay-back phase of throwing. By contrast, the lat has more of a "gross" depression effect on the scapula; it pulls it down, but doesn't contribute to posterior tilting or upward rotation. This might help with an adult rotator cuff pain patient who has an aggressive scapular elevation (shrug) substitution pattern, but it's actually problematic for a thrower who is trying to get his scapula up and around the rib cage to make sure that the ball-on-socket congruency is "flush" when it really matters: the maximal external rotation position. As such, you can say that the lat and lower trap "compete" for control of the scapula - and the lat has a big advantage because of its cross-sectional area and multiple attachment points. It's also much easier to train and strengthen - even if it's by accident. Upper body work in faulty core positioning (in this case, too much anterior pelvic tilt and the accompanying lumbar extension) shifts the balance to the lats. We'll often hear throwers cued "down and back" during arm care drills. The intention - improving posterior tilt via lower trap activation - is admirable, but the outcome usually isn't what's desired. Unless athletes are actually put in a position of posterior tilt where they can actually feel the lower traps working, they don't get it. Instead, they pull further down into scapular depression, which feeds the lat-dominant strategy. This is why we teach almost all our throwers to differentiate between depression and posterior tilt early on in their training at Cressey Sports Performance. 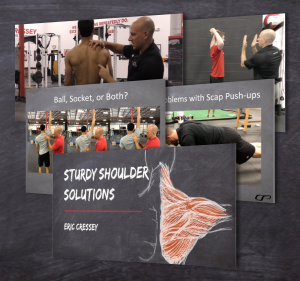 If you're looking to learn more about how I assess, program, and coach at the shoulder, be sure to check out my popular resource, Sturdy Shoulder Solutions. It's on sale for 30% off through Sunday at midnight; just enter the coupon code BASEBALL at checkout to get the discount. Learn more at www.SturdyShoulders.com. It's Opening Day, which is basically my favorite "holiday" of the year. I'm a huge baseball fan, and it means there is plenty of awesome Major League Baseball action to watch, including 39 Cressey Sports Performance athletes on MLB rosters to kick off the season. To celebrate, I've put my resource, Sturdy Shoulder Solutions, on sale for 30% off through Sunday at midnight. This has been one of my most popular resources of all time, so don't miss out on this great chance to pick it up at an excellent discount. Just head to www.SturdyShoulders.com and enter the coupon code BASEBALL at checkout to get the discount. 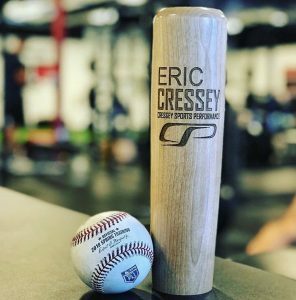 I came across this picture of Cressey Sports Performance athlete Corey Kluber on the Cleveland Indians Instagram feed the other day, and it reminded me to write this blog that I've had on my mind for quite some time. It's not an exactly perfect measure, but a vertical shin on the push-off leg during the pitching delivery is a pretty good indicator of pitchers having good direction to the plate. When the knee drifts forward over the toes, it's a pretty good sign that hip loading isn't optimal in the sagittal plane (hip flexion). Rather, the pitcher is "dumping" into the quad on the support leg. Additionally, unless you have really good ankle mobility (into dorsiflexion) it's hard to preserve a large base of support (i.e., the entire foot) through which you can apply force to the ground. The more the knee drifts forward, the more likely the heel is to come up off the ground. Corey is a great example of a vertical shin, and it's particularly impressive because he has quite a bit of extra "coil" in his leg lift, which can often make pitchers spin out of the hip and get rotational early. His ability to load back into hip flexion and apply force into the ground improves his direction to the plate and, in turn, his consistency and command (only 34 walks in 215 innings last year). Some great pitchers - Chris Sale and Jake Arrieta, for instance - will sacrifice good direction to the plate in order to optimize deception and/or stuff. In spite of the fact that they don't preserve heel contact along the rubber quite as long, they still preserve stability long enough into the delivery to make it work. You'll also notice these pitchers use their glove sides and "aggressive" stiffness into the front leg to bring them back on line. It's a higher maintenance delivery, but it can still be nasty. And, chances are that the success will be more related to the stuff than pristine command. My feeling is that with young pitchers, we want to coach to improve direction. They don't have a body of work to support the legitimacy of putting themselves into bad positions. This is where good footwork and intent during catch play is so imperative; it's where they hammer home direction and learn to load into the hip instead of drifting into the knee. Long-time Cressey Sports Performance athlete Tim Collins might be the best I've ever seen in this regard, and this is one reason why he's pitched in the mid-90s at a height of 5-7 throughout his pro career. In more advanced pitchers, you have to ask whether they've a) had success and b) stayed healthy. If the answer to both these questions is "yes," then my feeling is that you leave the direction alone and instead focus on taking care of optimizing their physical preparation. As example, a pitcher with a less vertical shin and more closed off delivery will need more hip internal rotation, thoracic rotation, and scapular upward rotation to get to consistently throw to the glove side. And if they can't do these things well, they'll often rip off accidental cutters to the glove side, have balls run back over the plate, or just sail fastballs up and armside. Last, but not least, my business partner (and CSP pitching coordinator) Brian Kaplan made a really good point recently: pitch "tunneling" is generally going to be significantly better for pitchers who have better direction. It makes sense, as less moving parts equates to more consistent vertical and horizontal release points, and a more direct delivery to the plate likely makes it harder for hitters to gauge depth (even if they are likely sacrificing some deception). If there is one thing our Major League hitters have told me about facing Kluber, it's that everything looks exactly the same until the split-second. So, long story short, you can't separate direction from pitch design and physical preparation; they all work together. And if you're looking for a good measure of direction, vertical shin (or something close to it) is a pretty good place to start. 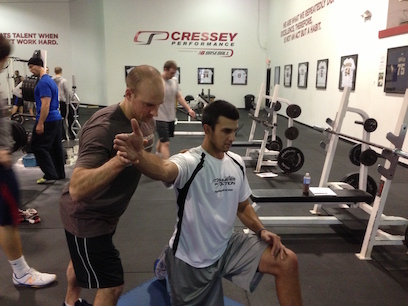 If you're looking to learn more about how we assess, program, and coach pitchers - both in terms of strength and conditioning and mechanics - - you won't want to miss our Elite Baseball Mentorship Upper Extremity course. Our next offering will take place at our Hudson, MA location on June 23-25. You can learn more HERE.